Drones are taking over the world, and it is not an overstatement! It started from increased usage in the military realm, and now it has come to take over our daily lives. One reason for this is because they are becoming more and more affordable, accessible and easy to use. And as it is embedded in human being’s nature, when something becomes more popular, we do find new and creative ways to use it. Below is the list of 5 crazy things drones are being used these days, for better or for worse! A delivery drone, is a name given to an unmanned aerial vehicle (UAV) which is utilized to transport packages, food or other goods. Here we will focus on drones delivering food items in particular, and one recent example is of a German-based restaurant on Anna Maria Island, Florida which has been testing a remote-controlled drone delivery service for quite some time. The delivery is called Old Hamburg Schnitzelhaus AIR, and is designed to deliver Schnitzel restaurant’s products to the nearby beach. It is currently pending regulatory approval, and was developed inhouse using DJI drone parts. A footage video that you can see above was released in November 2015. Genius is genius, whether evil or otherwise! This one though is not something to be proud of! In 2015, a Connecticut teenager strapped a handgun to a drone and fired the gun as the drone flew around. He wasn’t shooting at anyone, and no one was injured. When firing a gun from a drone failed to satisfy his thirst for invention and ingenuity, the teenager decided to install a flamethrower and fasten it to the drone. Technically since no one was injured, and the intent was “non malicious”, the boy didn’t break any laws and there was legal action taken against him. Small drones that are disguised as insects or birds have been on the scene for years now. But their development is usually attached with apparently clandestine firms like the Pentagon’s Defense Advanced Research Projects Agency (DARPA). In July 2016 100 students participated in the inaugural Liberty Cup the only northeast qualifier for the US National Drone Racing Championships. The students in this competition are required to research and build their own drones from the scratch, which the participants and the supporters recognize as a natural and beneficial extension of the STEM (science, technology, engineering, and math) curriculum. The student pilots wear “First Person View” goggles which lets them experience the twists and turns of the racetrack as they operated their drones from remote controls. 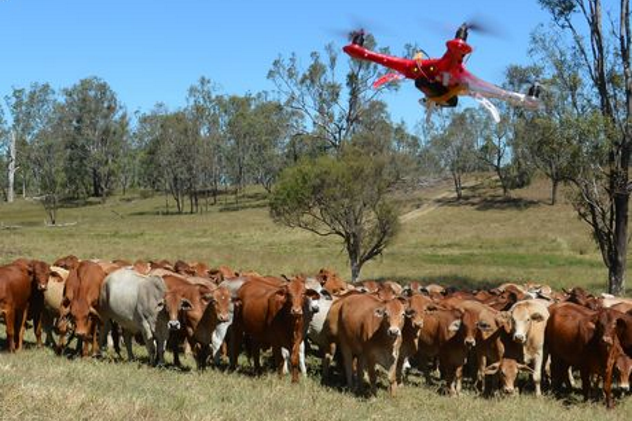 Ranchers have been increasingly relying on drones to help find lost cattle, but they also have started to use them to help bring the lost cattle home. According to Professor John Church, of Thompson Rivers University in British Columbia, Canada, he has seen and used drones that seem like a flying border collie used to herd cattle. Church doesn’t prefer that method, though. He prefers that the cattle remain oblivious to the drones monitoring them from above. Have any more cool drone related activities that you need to share? Comment below!